Your items will arrive in a "BASED BOX" Branded Bundle Box containing four Van Holten Pickles in Pouches. One of each flavor: Dill, Hot & Spicy, Sour, Kosher - Garlic. With the "best buy" manufacture's date clearly marked on the front of the bundle box. Why buy a BASED BOX Bundle pack over the other Amazon listings? ★ Quality ★ We don't sell expired or overstock items. Only the best items make it in our bundle packs. ★ Consistency ★ Same high quality every single time. Our Based Box quality control department makes sure every item is handpicked and packed to our high standards. ★ Packaging ★ Amazon ships products all over the country, sometimes other sellers get lazy with their packaging and cut corners to save a few bucks. NOT US! Our products are packaged correctly in high quality strong bundle boxes. We spend the extra buck or two to make sure our products are packaged and shipped with the upmost care, so you receive exactly what you ordered - Without having to deal with pesky shipping quality problems. ★ Prime Shipping Always ★ Our bundle packs are always sold using Amazon Prime shipping. ★ Service ★ We are available 24/7 to address any of your concerns. And, we offer the best money back Guarantee possible. If you aren't fully satisfied with your order, you can return it for a full refund, anytime! 100% NO Risk Money Back Guarantee. Individually wrapped pickles. Packaged and bagged. Pickled flavored things. 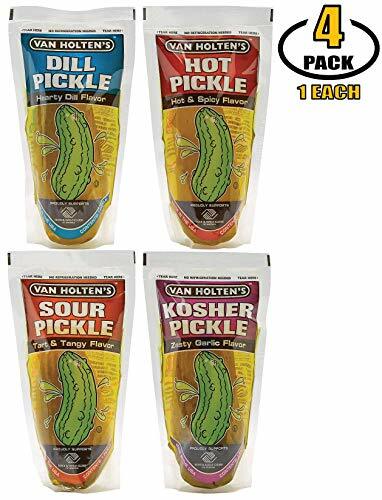 Van Holtens giant pickles packs. These are the best made large deli pickels. Pickle Juice great for cramps. Four different Flavors! If you have any questions about this product by BASED BOX, contact us by completing and submitting the form below. If you are looking for a specif part number, please include it with your message.